This weekend’s Purse Party 2016, especially before I begin five weeks of radiation treatments on Monday, was a welcome treat after almost six weeks of recovery following surgery for endometrial cancer. 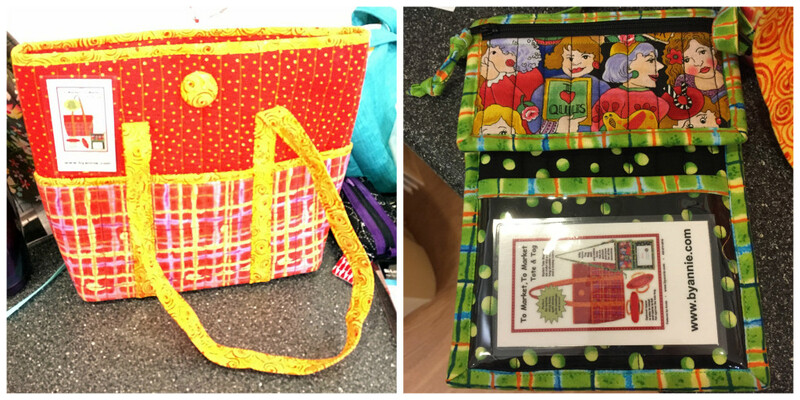 Purse Party is hosted annually by one of my local quilt shops, Quilter’s Cupboard in Ankeny, Iowa. 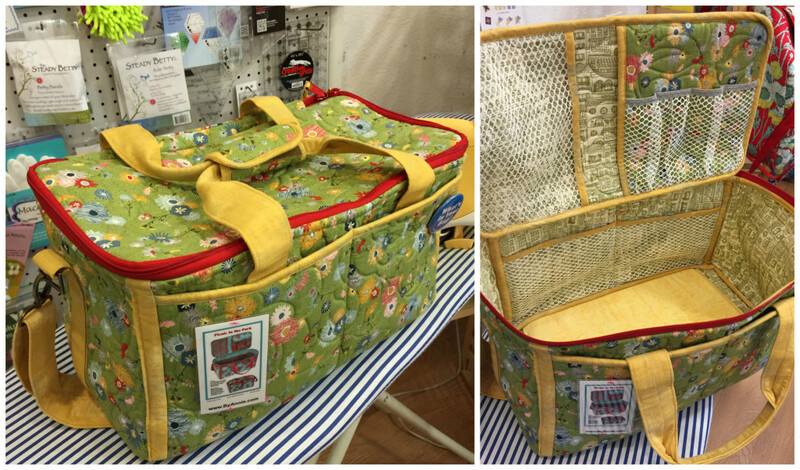 The newest bag patterns and samples are introduced, along with some old favorites. 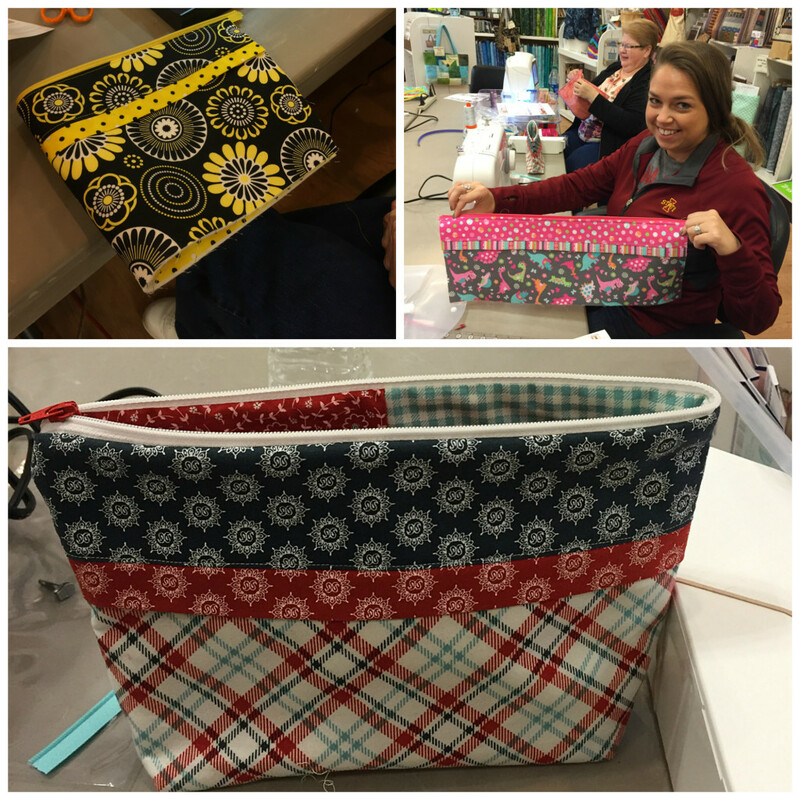 Bag-sewing tips are shared, and tools to make your bag-sewing easier are recommended. If you’re looking for a list of bag sewing patterns to attempt, scroll down to the bottom of this post, where you’ll find a list of patterns. You can order patterns directly from the friendly folks at Quilter’s Cupboard, or online if you prefer. 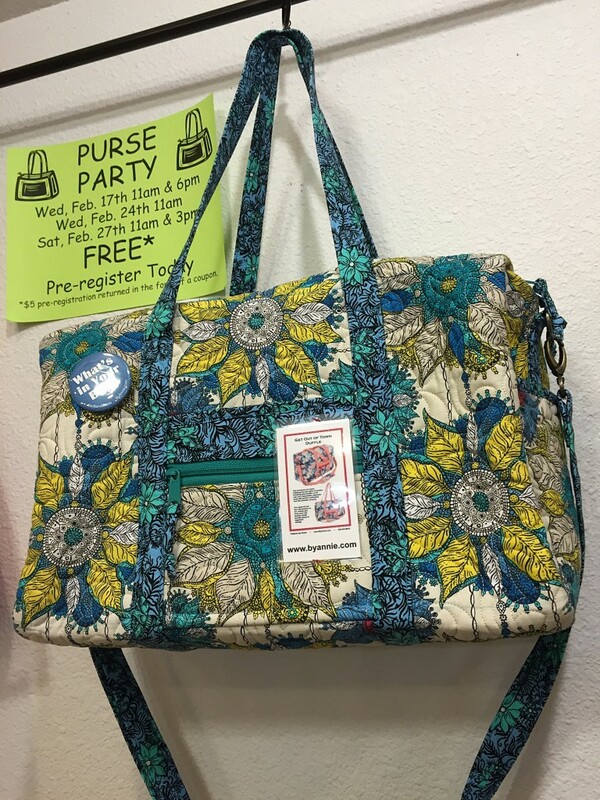 Purse Party attendees also receive a designed-by-Quilter’s Cupboard pattern, in this case the Place for Everything Pouch where you can store sewing or needlework notions, cosmetic supplies, jewelry, and even your colored pencils, blending stubs and other drawing tools. 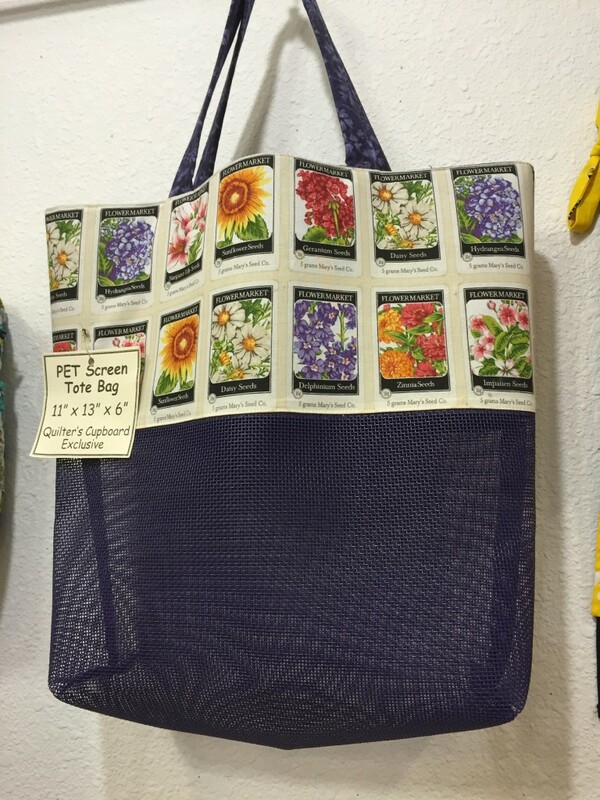 At a previous Purse Party, Quilter’s Cupboard offered attendees a free Pet Screen Tote pattern. This pattern is now available for purchase. Contact Quilter’s Cupboard directly. 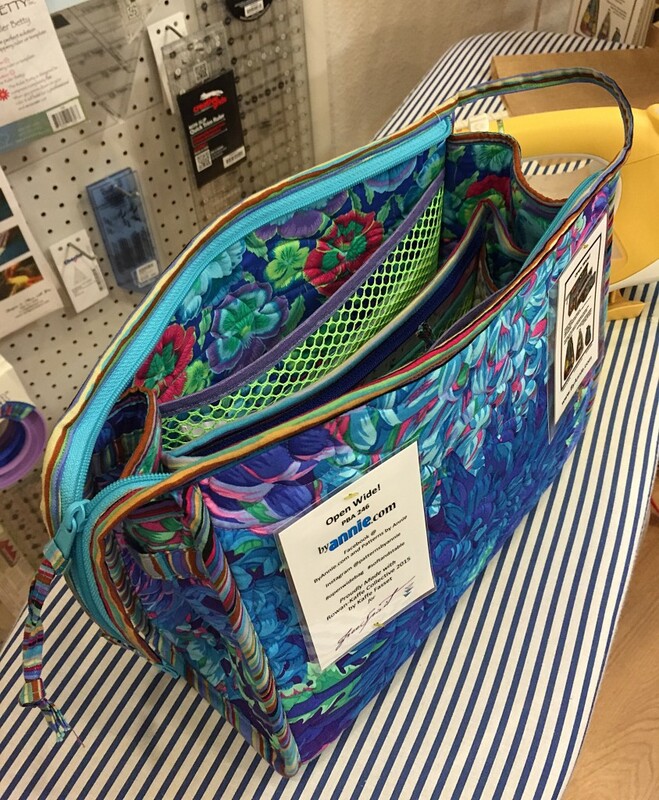 New this year was a Patterns by Annie Trunk Show featuring bags that punched quite a “wow” factor. Picnic in the Park, for example, is a fabulous padded, pocketed picnic basket layered with fabric and foam that produce a marvelously structured bag. 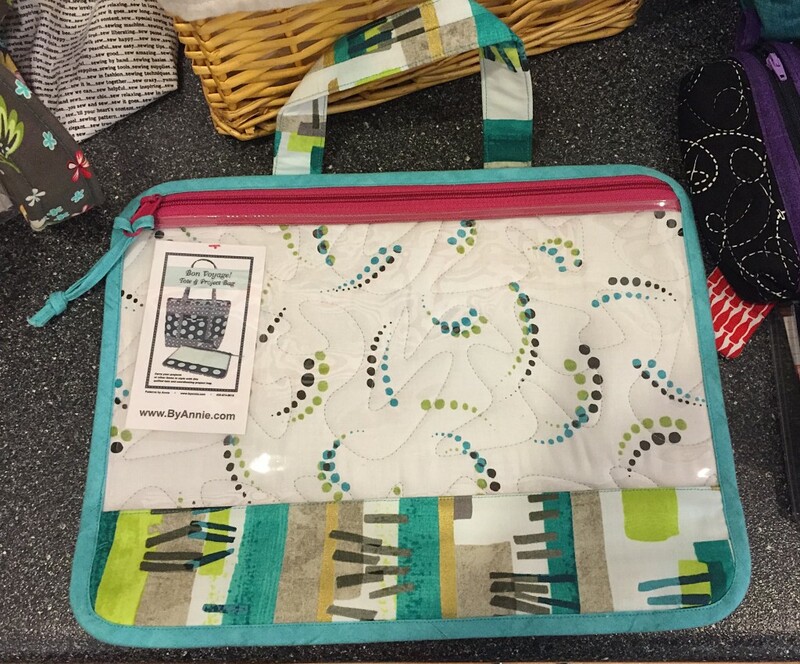 Quilter’s Cupboard owner Cindy Peters points out, however, that most people are making it to carry their sewing projects and notions for quilting retreats, sewing weekends, or a take-your-sewing-with-you vacation. Another Patterns by Annie pattern, Bon Voyage! Tote, is a generously-sized tote bag that includes outer slip pockets for your keys and phone, three inner slip pockets, and a hanging zipper pocket that is the perfect size for your electronic tablet. Also included with the pattern is a see-through Project Tote that would be perfect for keeping supplies for small projects together. Tuck in your pattern, fabric and notions, and you’re ready to go. I can imagine having an entire series of these! The Get Out of Town Duffle is a zippered, structured bag with lots of pockets. The bag fits perfectly into an overhead bin for your weekend flight. You’ll want to purchase the pattern, simply to learn how to make an adjustable strap with a shoulder pad. Shopping at a local craft fair? You’ll need the To Market, To Market Tote & Tag. Use the roomy zipper tote for purchased goods, and the Name Tag & Essentials Bag for your event I.D., credit card and loose bills. The Name Tag & Essentials Bag can be worn either around your neck or on your shoulder, and is adjustable. 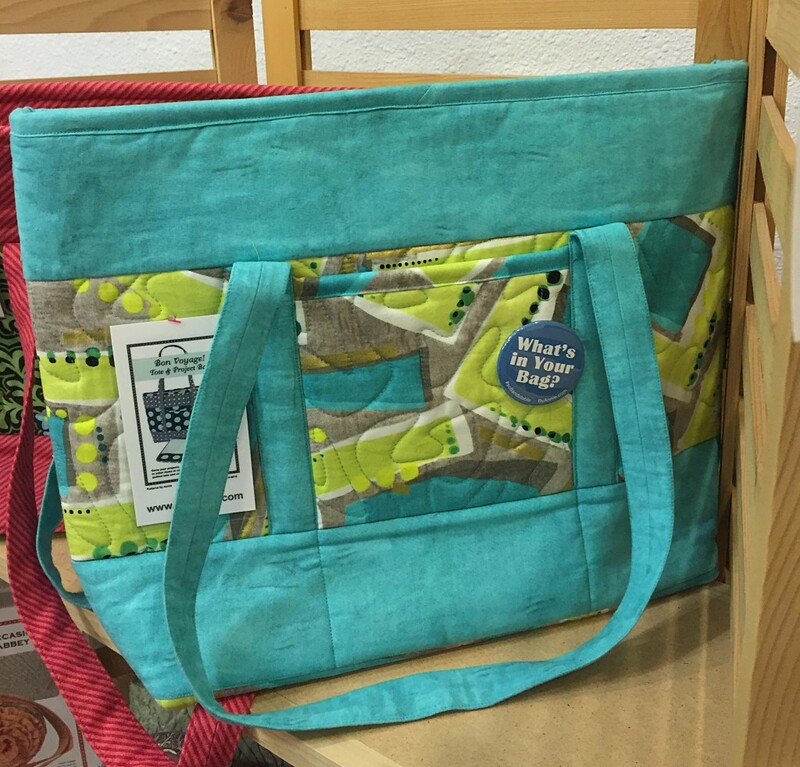 Although the pattern is easy to follow, you can watch a series of video tutorials by Patterns by Annie that walk you through the steps of making the Name Tag & Essentials Bag. The Open Wide! Bag is aptly named because it opens up wide and allows easy access to contents. Organize your belongings with the handy mesh pockets. 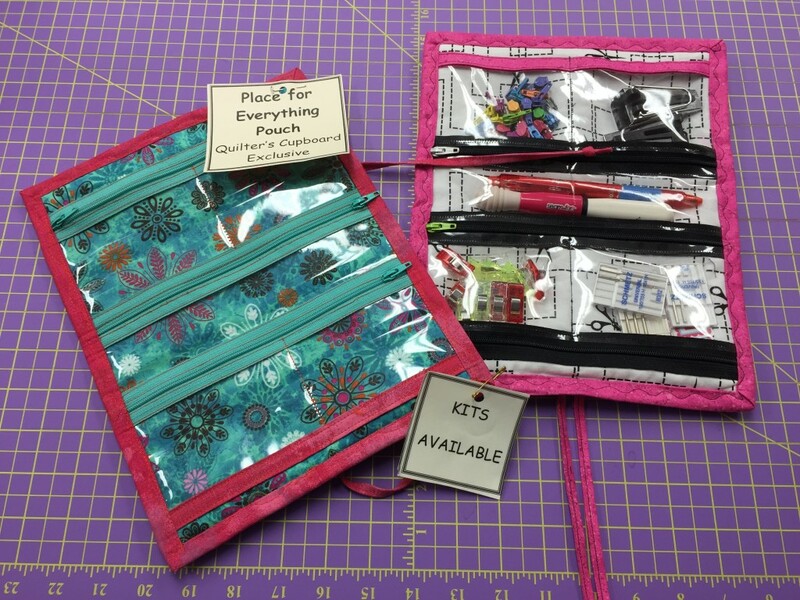 The pattern includes three sizes, perfect for organizing your travel supplies. 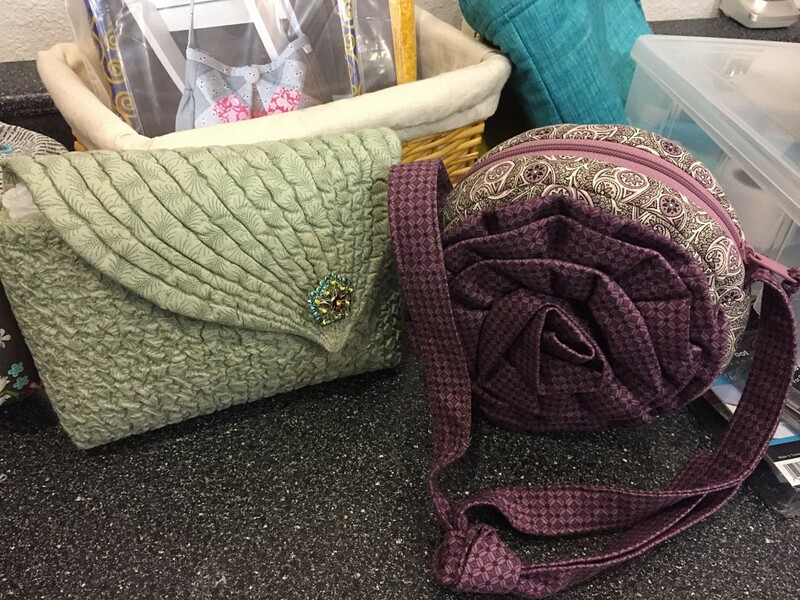 Special Occasions at the Abbey is actually a two-for-one pattern, featuring Lady Sylvia’s Swirl purse and Lady Edith’s Ruffled Rosette purse. Both bags are just big enough to hold your evening essentials. The patterns are inspired by the ladies of Downton Abbey. These tiny bags generated a great deal of excitement at Purse Party. When I visited Quilter’s Cupboard today to take photos for this post, several women were engaged in a sewing class, making Becca Bags from Lazy Girl Designs. What makes these “stow and go” bags extra special is the easy circular One-Zip technique, which involves cutting a zipper apart, removing the pull, and stitching in one side of the zipper tape straight and flat. Bring the ends of the zipper together and slide the zipper pull back on. When you open the bag, the zipper installation allows the bag to open up wide, and the bag stands on its own. Don’t throw away your Bosal In-R-Form or By Annie’s Soft and Stable foam stabilizer scraps. Instead, use Heat Press Batting Together to fuse the bits together on both the front and back. When you use a foam stabilizer, the seam layers can become quite bulky, especially if you plan to apply bias binding. Compress them by sewing parallel lines of straight stitching between the seam line and raw edge, or use a zigzag stitch. You can also do a decorative stitch on the outside of the bias binding, which looks nice and does essentially the same thing. Instead of installing metal purse feet, consider sewing buttons to your bag bottom. Layer large and small buttons together to achieve thickness. To produce soft-but-strong purse straps, use Dreamy Fleece Fusible from Lazy Girl Designs, or Pellon 987f Fusible Fleece (available at JoAnn Fabrics). If you are having trouble sewing layers or hard-to-sew spots, try using Fabric Fuse Liquid Adhesive by Therm-o-Web. To give your bag both softness and structure, layer Dreamy Fleece Fusible (or Pellon 987f Fusible Fleece) and Pellon 809 Decor Bond (a fusible heavyweight woven interfacing, available at Joann Fabrics). Use 505 Spray and Fix Temporary Fabric Adhesive to make anything fusible that is not fusible. This is a temporary basting spray, so it does wash away, but in most cases you will not throw your finished bag into a washing machine. 505 Spray will not gum up a sewing machine needle. To add body to a fabric, or to turn a cotton fabric into home decor fabric, iron on Pellon SF 101 Shape-Flex®. If zipper installation makes you nervous, visit By Annie’s Zippers Are Easy Videos. To measure, mark and press hems all in one step, use the newest heat-resistant Clover Press Perfect Hot Ruler by Joan Hawley of Lazy Girl Designs. It’s great to use for bag handles, binding hems, rounded corners, and interior and mitered corners. Fold your fabric over the Hot Hemmer, and press your fabric into place with either a dry or steam iron.